Weighty Matters: A Single "Food Product" That Encapsulates the Entirety of the Problem. A Single "Food Product" That Encapsulates the Entirety of the Problem. 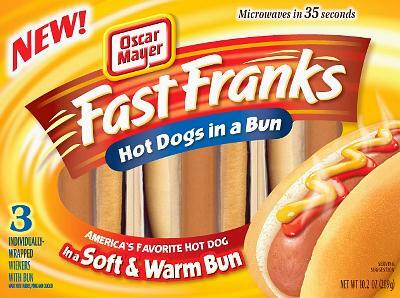 Because cooking a hot dog and putting it in a bun is "slow"? But this Frankenfood speaks volumes. As a society we value convenience and speed over nearly everything else. Consequently there's a demand for products like "Fast Franks", or more commonly for health washed products that people feel give them the same benefits as from scratch but quickly and conveniently. Is there anything in life that's valuable that requires little or no effort? Cooking, and perhaps slightly more specifically, prioritizing and finding the time to cook healthful meals - at this point, there's no way around it.